This dialog shows the Pagometers and Financial status of the user, and is shown after a tap on the User button in the footer of the main panel. Depending on User Privileges the Financial section might not be shown. For an Internal User a Password button is shown, when a password has been set (i.e. not erased): see Section 4.4.4.8, “Password”. A tap on the button will show the Password Reset Dialog. When users are allowed to change their PIN a PIN button is shown. A tap on the button will show a PIN Reset Dialog. See Section 4.10.3, “User Authentication”. 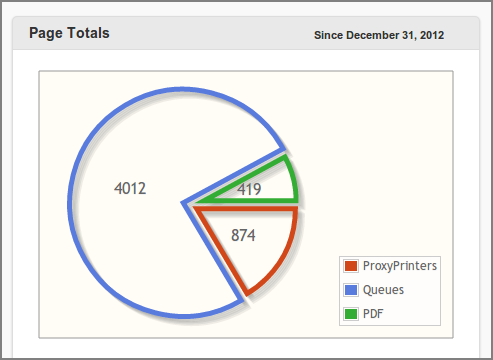 When an Internet Print protocol://authority is present the Internet Printer button is shown. 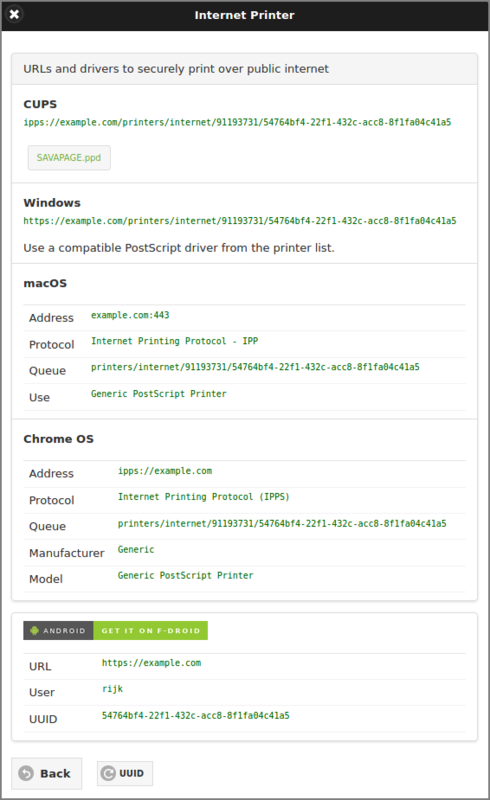 A tap on the button will show the Internet Printer Device URI. Users can copy/paste their private Internet Print Device URI from this dialog, and the SAVAPAGE.ppd file can be downloaded. This section shows the personal Pagometers of the user, and are analogous to the ones in the Admin Dashboard as shown in Figure 4.9, “Admin Web App: Dashboard - Pagometer” and Figure 4.11, “Admin Web App: Dashboard - Environmental Impact”. This section shows the financial status of the user account and ways to increment the account balance from an external account. 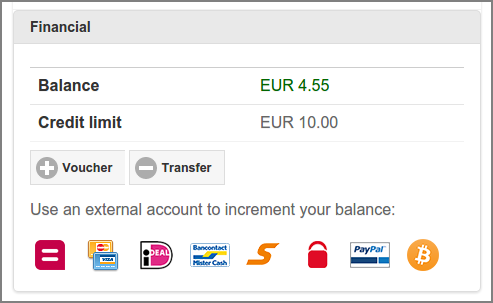 Depending on User Privileges the section for account transactions might not be shown. Balance: the user's account balance. Credit limit: see Section 4.4.4.7, “Financial”. A push on the Voucher button opens the Redeem Voucher dialog. The visibility of this button is dependent on an application setting. A push on the Transfer button opens the Transfer Credit dialog. The visibility of this button is dependent on an application setting. When a Generic and/or Bitcoin Payment Gateway Plug-in is enabled, an icon is shown for each active payment method. 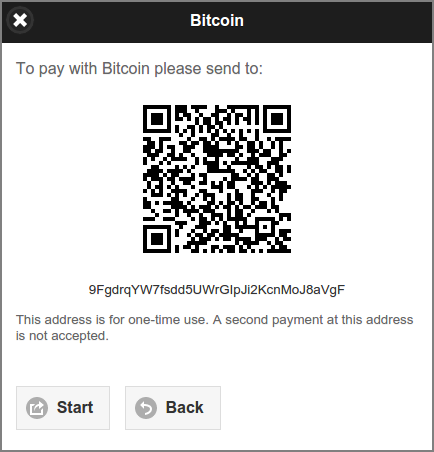 Pushing (clicking) the payment method icon will pop-up the dialog to Transfer Money or to Transfer Bitcoins. Enter the voucher Number in the dialog box and press Redeem. Make sure to enter the number exactly as listed on the voucher including any dashes (-). 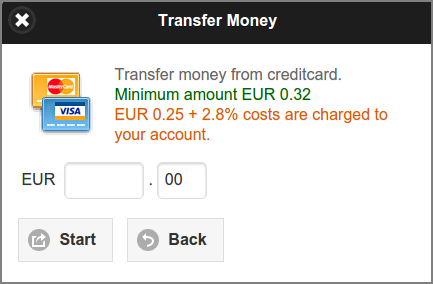 This dialog is used to transfer funds to another user. Enter the Amount in currency units and cents. The available amount is shown in green at the top. Enter the To user id and an optional Comment. 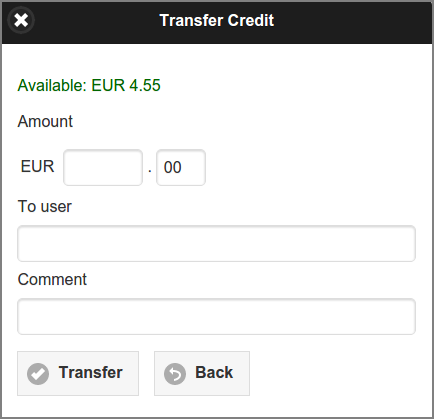 When you press the Transfer button the amount will be transferred from your account to the account of the target user. New entries will list in your transaction log and the log of the target user. To configure this dialog see Section 4.10.12.5, “Transfer Funds”. This dialog is used to transfer money from an external account. The figure below shows a dialog in preparation for a credit card transaction. Other payment methods are available as defined by the active Generic Payment Gateway Plug-in. See for example Section M.1.1.1.1, “Mollie Payment Plug-in”. Enter the Amount in currency units and cents. Press the Start button to start the payment transaction. This dialog is used as a start to send Bitcoins to the account balance. Note: the Bitcoin address in the screenshot is intentionally made invalid. Press the Start button to automatically open a send transaction in the default Bitcoin wallet on your system. Open a send transaction manually in a Bitcoin wallet application on your computer or device (Android, iOS, ...) and either scan the QR code or copy/paste the Bitcoin address (below the QR code). ... and enter the amount to send from your Bitcoin wallet. The BTC amount is converted to the system currency according to the exchange rate of the Bitcoin service back-end of the Bitcoin Payment Plug-in.